Note : Please Remember to send all the details like your current CTC, Expected CTC, etc. all the details while sending your resume. Company Name :Empower IT Systems Pvt LTD . .
Selenium, Java, API testing, performance testing, must have developed test automation suites for at least 2-3 different products. - Excellent computer fundamentals, analytical and problem solving skills. - Exceptional testing skills. Provide good attention to details. Company Name :RANDSTAD INDIA PVT LTD . .
Company Name :Trantor Software Pvt. Ltd. . .
*Create and maintain data for PMR (Project Management Review) reports and external audits. *Extensive exposure to all the phases of Software Development Life Cycle (Especially in Agile model) with quality assurance process. *Liaise with development team for bug fixes and changes. Company Name :Ingenium Technologies Private Limited . .
Company Name :Xavient Software Solutions India Pvt Ltd. . Hands on experience in Core Java Concepts . Experience in Designing and implementing test automation frameworks with selenium webdriver, TestNG/JUnit , Maven/Gradle , GitHub/Bitbucket/Teamcity , BDD etc. Extensive experience in code repository/version control in GitHub/Bitbucket(preferred) /SVN. Note : Candidates who can join early will be preferred. Venue : Xavient Digital-powered by TELUS International. Company Name :Amanzi Technologies Pvt. Ltd. . Expert on UC products like SL11/2100, SV81/9100, BX-SBC, UC Suite, Std. SIP terminals, SIP Trunks, IP Dect, VMware, Data networking, SIP Mobility clients, Firewall. Company Name :The Corporate . Strong DB and SQL knowledge. A strong desire to collaborate and work within a team. Company Name :Bureau Veritas Consumer Products Services (India) Pvt. Ltd. .
Company Name :HEADSTRONG SERVICES INDIA PRIVATE LIMITED . 1-Strong QA concepts and knowledge of STLC & SDLC. 2-Strong skills with any automation tool (Selenium Webdriver & Java ). 4-Real time experience in testing of complex Web Applications. 5-Ability to work independently, multitask and manage time. Company Name :Marg Compusoft Pvt. Ltd.(Marg ERP Ltd.) . 2. Good knowledge on Agile, Jmeter etc. Company Name :CrossRoad Solution . Awareness of revision control systems like Git, SVN, TFS etc. Awareness of QA processes like acceptance criteria, test planning, test case execution, automation testing etc. Awareness of QA tools like qTest, JIRA, Bugzilla etc. Working knowledge of basic programming techniques (looping and control statements) and OOPS concepts. Closely partners with the Developers at the onset of a project, to develop product requirements, test specifications, and build test cases to rigorously test product functionality. Performs analysis on applications/stories, writes manual and/or automated test plans and executes on test suites. Reviews and provides input on the accuracy, clarity and testability of requirements; asks questions to improve software design. Works with cross-functional teams and interacts with internal and external stake holders (client) to verify/clarify business requirements and design decisions. Understanding, accepts constructive feedback, and handles confrontation constructively. Company Name :Boutiqaat Group for Perfumes Beauty Products Co. Pvt. Ltd. .
Company Name :MetLife Global Operations Support Center Pvt. Ltd. .
Company Name :FranConnect India Software Pvt. Ltd. .
Company Name :Agreeya Solutions India Private Limited . Company Name :AthinkSys Software. .
Company Name :Appinventiv Technologies. .
Company Name :AgreeYa Solutions India Private Limited. .
3. Experience of working in e-commerce domain. Company Name :Orcapod Consulting Services Private Limited. .
2. Continuous integration tools such as Jenkins, Test NG, Maven etc. Company Name :ATLAS Systems Private Limited. .
2. 4+ Years of experience in functional testing and DB testing along with API Testing. 3. Working knowledge of different Database flavors mysql, sql server, postgresql etc. 5. Experience in one of the Performance Testing tools e.g. Apache Jmeter, Siege, Taurus etc. 6. Familiar with Bug tracking tools e.g. Bugzilla, Jira and open source. 7. Hands on experience in automation Scripting, DOS/Linux commands. Company Name :Eli Research India Private Limited . Company Name :Pyramid IT Consulting Pvt Ltd. .
- Hand-on experience in Load testing tools (VSTS, Load Runner, Jmeter, Performance center, HP SaaS etc). - Hands on experience in profiling and performance monitoring. 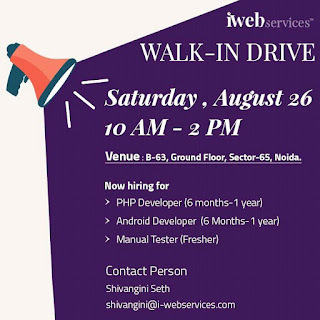 - Hands on experience in testing of web services(both rest and soap services). - Very strong in design of test framework, load simulation model, load stats calculations. Excellent technical/analytical skills and/or strong programming and design skills. Company Name :HCL Technologies Ltd . .
Company Name : Gateway TechnoLabs Pvt. Ltd . .
Company Name : Pyramid IT Consulting Private Limited. .
Company Name :NIIT Technologies Ltd .
* Hands on exp in Execution, Regression, retesting, Release Testing, UAT etc. Software Testing with Airline domain experience is must. Company Name : Inncon . Company Name : NIIT Technologies Ltd. .
Company Name :Motherson Sumi Infotech Design Ltd .
Company Name : Commdel Consulting Services PRIVATE Limited . Company Name : BRAVVURA DIGITAL PRIVATE Limited . Company Name : Vozic Technologies . Automation Testing, Selenium , Appium. Company Name : Infogain India (P) Ltd. .
Request you to carry your updated resume and ID Proof with you. Company Name : IRIS SOFTWARE Inc. .
1. Able to write Functional, Integration and Regression test cases from the analysis of requirements document. 3. Ability to document the test results and log issues in issue tracker [JIRA]. 5. Ability to interface with Client, development team and get the issues resolved and should be able to work as an individual contributor. 6. Should have knowledge about web services testing, hands- on tools like Fiddler, Postman etc..
7. Agile preferably but NOT Mandatory. Company Name : Anu Recruitment Pvt. Ltd. .
Company Name : Plasma Softech Pvt. Ltd. .
*Good to have knowledge selenium Automation Testing skill. Company Name :DevStringx Tech pvt Ltd. .
Company Name : Crestech Software Systems Pvt Ltd.
Strong experience in automation testing using Selenium Web driver. â€¢ Should have automation experience in Mobile Application Testing using tools like Appium. â€¢ Programming experience with Java or any other object-oriented language. â€¢ Experience developing highly reusable and efficient Test frameworks. â€¢ Experienced in Database testing and Manual testing. â€¢ Hands on experience with Maven, TestNG, and JIRA. â€¢ Experience in E-commerce domain will be plus. â€¢ Good communication skills both oral and written. â€¢ Knowledge of Web Analytics and testing of same using tools like Charles, Fiddler or Browser Mob will be an added advantage. Good Analytical and logical problem-solving skills. Working experience with Selenium and Jmeter. *Good to have selenium Automation Testing skill. Company Name : GSPANN Technologies. .
Company Name : BRAVVURA DIGITAL PRIVATE LIMITED. . Experience of 3 years on manual testing with over 2 years of experience on Automation testing. Experience of working on E-Commerce platform. Good hands-on exposure with Functional, regression, retesting, security and System testing. Hands on experience on Usability Testing, interface testing, compatibility testing, Performance Testing, security testing. Good knowledge of reading logs for any bugs to check RCA. Good verbal and written communication skill. Company Name : Crestech Software Systems Pvt Ltd. .
*Good to have experience in Java Development. Company Name : Ginger Webs Pvt. Ltd. . .
Selenium automation framework development/extension using Java bindings. Company Name : RBS SERVICES INDIA PRIVATE LIMITED . Strong Web Services and SOAP UI concepts. Batch CAT checks, automated solution for comparison. Company Name :FIS Global Business Solutions India Pvt Ltd. .
Company Name :R. Systems International Ltd. .
Company Name :R1 RCM Global Private Limited . Location : R1 RCM, SEZ, Candor TechSpace, 7th Floor, Building-9, Plot No 20 & 21 Sector 135, Noida (U.P.). Company Name :HCL Technologies Ltd .
Company Name :UK Consulting . Company Name : Hcl Technologies Limited . Company Name : BORDERLESS MIND TECHNOLOGIES PVT LTD/ ISHIR . *Good to have Jmeter Performance testing skill. Company Name : HCL Technology Ltd.
Company Name : PureSoftware Pvt Ltd.
Company Name : Cognizant Technology Solutions pvt ltd.
Company Name : BORDERLESS MIND TECHNOLOGIES PVT LTD/ ISHIR. Company Name : SFJ Business Solutions Pvt Ltd.
Company Name :Tech Mahindra Ltd .
Company Name :HCL Technologies Limited . - Candidates from product/startup environment - Added advantage. Company Name :Xoriant Solutions Pvt Ltd .
Company Name :Xavient Software Solutions India Pvt Ltd. Skills : Supreme on Selenium RC, Selenium IDE, Selenium Grid or Selenium Web driver. A designer in Selenium Model View Controller Test Framework. Proficiency in SoapUI/ Groovy & UFT. Can play with code building tool 'ANT' and Hybrid Framework Model. Thorough with Software Development Life Cycle (SDLC), Software Testing Life Cycle (STLC). Detail oriented, persistent and patient. strong experience in Software Development Life Cycle and agile Methodologies, developing test plans, test templates and sprint releases. Company Name :PureSoftware Pvt Ltd.
Company Name :Amiga Informatics Pvt. Ltd. Skills : Strong in Automation testing including the automation tool-Selenium (Selenium Web Driver), TestNg, Eclipse, and preparation of automation test framework (BDD/ATDD/DDT) along with Java. Manual Testing , api testing , Database . Skills : Strong in Manual & BFSI . Company Name :Larsen & Toubro Infotech Limited. Skills : Strong in Selenium along with core Java. Company Name :R. Systems International Ltd. Skills : Strong in Selenium along with Java. Company Name :Impressico Business Solutions Pvt Ltd..
Company Name : Talentiser Pvt Ltd..
Company Name :Modern Ballistic Solutions Pvt Ltd.
Batch CAT checks, automated solution for comparison..
Company Name :RBS SERVICES INDIA PRIVATE LIMITED. (www.rbs.com). Company Name :Friends Color Images Pvt. Ltd. (www.smartbox.in). Skills : Strong experience on performance testing with JMeter. Company Name : icreon communications pvt. ltd.. Skills : Experience in JIRA, Experience in creating UAT Test cases. Company Name : Tech Mahindra Ltd..
Project with renowned B2B e-commerce platform "IndiaMart"
Company Name : Career Options..
Company Name : Think Future Technologies Pvt Ltd.
1. Must have 2-5 years of QA experience. 2. 2+ Years of relevant Automation testing using Selenium and Java. 3. Strong Functional /manual QA experience. 4. Strong knowledge of SQL is required. 5. Prepare & manage test environment. Company Name : edynamic - A Digital Marketing & Technology Agency. 3. Should have APPIUM experience for mobile test automation. 4. Strong Functional /manual QA experience. 5. Strong knowledge of SQL is required. 6. Prepare & manage test environment. Company Name : Talentiser Pvt Ltd.
1. Must have 5+ years of QA experience. 2. 3+ Years of relevant Automation testing using Selenium and Java. 3.Should have APPIUM experience for mobile test automation. 5. Strong knowledge of SQL and Linux is required. Company Name : infozech Software Pvt. Ltd.
* Prepare & manage test environment. Company Name : PureSoftware Pvt Ltd..
Manual Testing , api testing , Database , Soap/Rest/Web services . Company Name : Onward Technologies Ltd.. Expertise in creating reusable Hybrid framework with Java . Knowledge of supporting tools like Eclipse, TestNG, Cucumber Junit, Maven, Grid, Jenkins, Git is appreciated. Company Name : Headstrong Services India Pvt Ltd.. Knowledge of supporting tools like Eclipse, TestNG, Junit, Maven, Grid, Jenkins, Git is appreciated. Company Name : Capgemini Technology Service Pvt Ltd..
Company Name : Aristocrat Technologies India Pvt Ltd..
Latest Jobs in Software Testing. Genuine Jobs in Software Testing. Software Testing Jobs in Delhi NCR. Software Testing Jobs in Pune. Software Testing Jobs in Hyderabad. Software Testing Jobs in Bangalore. nice post! I really like and appreciate your work, thank you for sharing such a useful information about jobs whare we hardly find the true facts about it. here i prefer some more information about jobs for your career hr jobs in hyderabad .